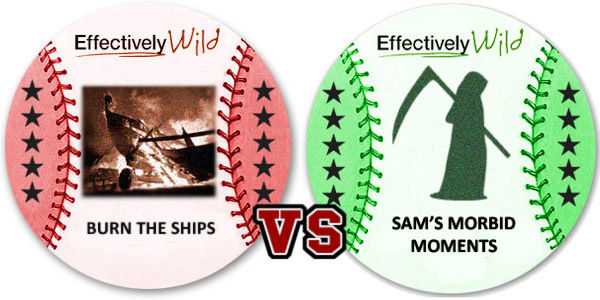 Welcome to the final round of the 2017 Effectively Wild Tournament Bracket Classic, where it all comes down to motivation vs nihilism. It’s the Semi-Finals of the 2017 Effectively Wild Tournament Bracket Classic. Welcome to the Round of 8 of the 2017 Effectively Wild Tournament Bracket Classic, where we bid farewell to the Burrito Method, Gonny Jomes, and Rich Hill. Welcome to the Round of 16 of the 3rd Annual Effectively Wild Tournament Bracket Classic. Here are the results of the opening round’s second half. Trampolines upset Watching Videos, and Smash Mouth traded leads with Baseball Movies/Shows before winning by nine votes. Welcome to the second half of the opening round of the 3rd Annual Effectively Wild Tournament Bracket Classic. Before the next set of matchups, here are the results of the first half, in which all the top seeds advanced. Welcome to the first half of the first round of the 3rd Annual Effectively Wild Tournament Bracket Classic. Banished to the Pen has compiled 32 of the Effectively Wild podcast’s classic topics, favorite players, and most enduring/endearing running jokes.